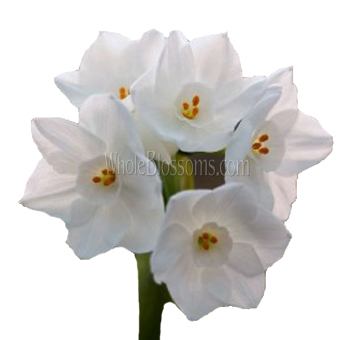 Narcissus Flower is a very elegant looking variety that allows you the ability to create centerpieces and bouquets with finesse. It is an especially appealing flower for spring and fall arrangements but can be selected for use any time of the year. The beautiful Narcissus flower is a species that is mainly native to the meadows and woods of southern Europe and North Africa. A center of diverse flowers even blooms in the Western Mediterranean around the Iberian Peninsula. The Narcissus is basically the name of a genus under which there are flowering plants like daffodils, jonquils and paperwhite flowers. The Narcissus has small flowers that have six tepals that are petal-like and a trumpet-shaped corona. The Narcissus flowers were famous even in ancient civilizations. They were cultivated for both botanical and medical purposes. The entire genus has about ten divisions and 50 species. However, the number of confirmed species has always varied depending on the classification due to the similarities between the species. The exact origin of the name Narcissus is unknown, but it's often linked to the Greek word for intoxication or narcotics. Then there was also a myth of a man who fell in love with his own reflection. These are long-lived bulbs which reproduce by division, but some species have become extinct, and some are on the verge of extinction due to urbanization and tourism.The Narcissus papyrus which is commonly called the paperwhite flower is an ivory bloom which looks beautiful in bunches. The paperwhite flowers are easy to grow even indoors and are available all year round. The paperwhite flower is especially unique. On its own, without the stem, the paperwhite flower is as delicate as they come. But their stems are sturdy, and the flowers grow upright. The foliage of this plant is beautiful as well. Paperwhite cut flower is a hardy flower which suits sturdy flower arrangements the best.Centerpieces and bridal bouquets are the most common places you'll find the paperwhite cut flower in. Many brides today are increasingly opting to use these for their delicate charm. The smaller blooms are perfect for fillers, but these flowers stand out on their own too. An entire composite bouquet made out of paper white flowers is just as beautiful as a rose bouquet with the flowers as an accent. The Narcissi bloom is available all year round. They are always in demand since daffodils, jonquils, and paperwhites make extremely beautiful ornamental flowers. Many weddings and special events make use of the narcissi genus family members. For event planners or do it yourself brides it’s important that you buy them in bulk. Purchasing in bulk can be very budget friendly as flowers for such events can get expensive. You should also make sure that you've contacted the correct vendor is also essential. However, we suggest that instead of running around you look for good online wholesalers. One of the trusted and renowned names would be Whole Blossoms. They can basically cater to all your flower needs. They are a wholesale cut flower business that guarantees fresh flowers delivery right at your doorstep. Moreover, their 24/7 hour delivery system is a blessing for event planners.